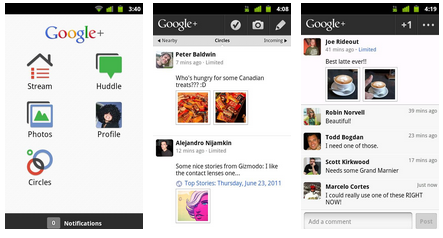 You can download the Google+ App for Android in the Market. But you can't use it until you're activated for the new Facebook-Killer. Remarkable that the app is available in many countries, before the service isn't even accessible for everyone. But the comments in the Android Market show that some people aren't happy with that or get confused about it. The auto upload feature for photos could turn out to be the most interesting feature for some people. But you can already do this with Auto Uploader. I bought this before and it works great for different services. This is hot. Either Google+ turns out to be the greatest flop of all time, or it will change social networking forever. Check the official Google blog to learn more about.